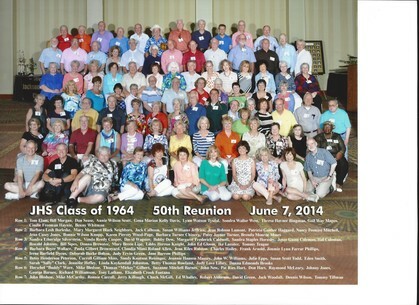 Keep watching for an announcement regarding a Class Reunion the weekend of the All Class Reunion, June 1, 2019! Welcome JHS Classmates and Guests! Thanks for coming by! If this is your first visit, get started by making your profile. Personalize it by adding pictures, You Tube Videos, and Playlists. Discover how to do it all on the "Site Help" link to the left! Share your page with your classmates, family, and friends. As time goes on, please remember to keep your profile up-to-date with current contact information, and enjoy using this site as a portal to reconnect with old friends between graduating years. GET STARTED: Look to the left of the page and find "Classmates" then select "Classmate Profiles." Click on it and find your name there. Click on your name and it will take you to a page that says "Join Here." Then "Click here now" and follow the instructions of adding your email and password so you can interact with your classmates. You don't have to finish it all at once. Come back whenever you want to add to or update your information, or add more photos.